Primary voting to whittle down a field of 26 candidates for the seat held by the late Walter B. Jones Jr. started this week. Voters in North Carolina’s 3rd Congressional District will have plenty of choices. Republican primary voters will be presented with a slate of 17 candidates, while six Democrats will face off in their primary. Among the state’s smaller parties, the Libertarians had two filings, ensuring a rare third-party primary in the district, while one candidate filed under the Constitution Party banner. If you registered with a specific party, you can only vote in that party’s primary. Unaffiliated voters can choose a party for primary voting. None of the Democrats hail from the local area, but voters will be familiar with some of the names on the GOP ballot, with three Currituck County residents running. Two of the Currituck residents, Paul J. Beaumont and Michael H. Payment currently serve on the county’s Board of Commissioners. The third Currituck candidate, Kevin Baiko of Moyock is a medical doctor who has been active in the cannabinoid medical rights field and serves as the medical director of the North Carolina Cannabis Patients Network. If no candidate receives 30 percent of the vote in the April 30 primary the candidate coming in second can request a runoff election. If a runoff is required, that election will be held July 9 and the special general election will take place September 10. If no runoff election is required in either of the two parties with more than two candidates in the primary, which would be the Democrats and Republicans, the special general election will be held on July 9. One-stop absentee voting (commonly known as “early voting”) allows any registered voter to cast an absentee ballot in person on select days prior to Election Day. Unlike on Election Day, when registered voters can only vote at their specific precinct, one-stop voting allows registered voters to vote at any one-stop absentee voting site in the county. 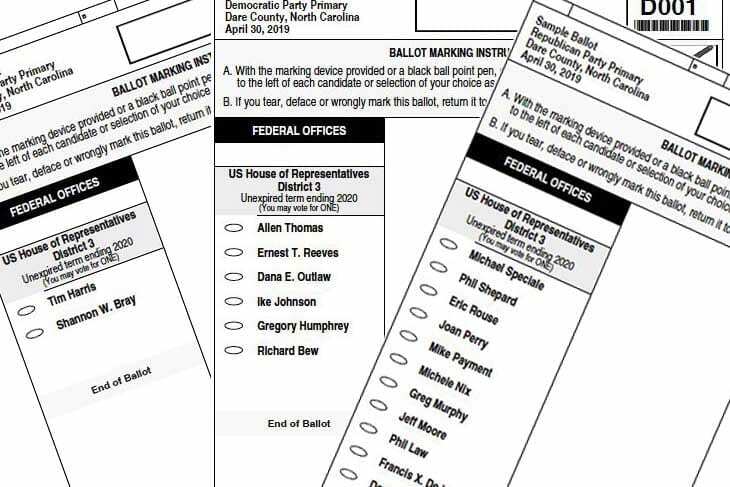 One-stop sites will have all the ballot styles for a given election at each site. Curbside voting is offered at all Dare County polling places. To be eligible for curbside voting, you must be unable to enter the polling place due to age or physical disability. Look for the call bells near the polling place entrance labeled “Curbside Voting.” Poll workers will walk to your car when you park in one of the designated spaces to attend to your voting needs. Early voting in Currituck County is at the Board of Elections office during regular hours, 8 a.m. to 5 p.m., 2811 Caratoke Highway in Currituck. The winner will fill the remainder of the two-year term in the Third Congressional District, which includes all or parts of Currituck, Camden, Pasquotank, Perquimans, Chowan, Tyrrell, Dare, Hyde, Beaufort, Pamlico, Carteret, Pitt, Craven, Onslow, Jones, Lenoir and Greene counties. Jones, a Republican who served in the House of Representatives for 24 years, died Feb. 10. His current term runs through 2020.